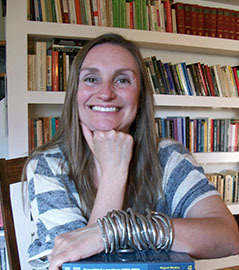 Barbara Zecchi received her PhD from the University of California Los Angeles (UCLA) in 1998. After teaching at different universities in Spain (University Carlos III of Madrid, University of Valencia, University of Cádiz) and in the US (Saint Mary's College of California, California State University and the Johns Hopkins) she joined the University of Massachusetts in 2005 and was promoted to full professor in 2015. At UMass she is a faculty member in the Dept. of Languages, Literatures and Cultures and in the Interdepartamental Program in Film Studies. After directing the Spanish and Portuguese Graduate Program (2010-2012) and the Spanish and Portuguese Unit (2012-15), the University of Massachusetts Translation Center (2015-17) and co-directing the Digital Humanities Initiative Program (2014-2017), she has recently assumed the new position of Director of the UMass Interdepartmental Program in Film Studies. Zecchi's research and teaching interests include gender studies and feminist film theory, adaptation theory, digital humanities and videographic criticism. In addition to about 50 articles and book chapters, and several video-graphic essays, she is the author of the monographs La pantalla sexuada (Cátedra, 2014) and Desenfocadas: Cineastas españolas y discursos de género (Icaria, 2014), and of the edited volumes Gynocine (Univ. Zaragoza, 2013), Teoría y práctica de la adaptación fílmica (Complutense, 2011), La mujer en la España actual, ¿evolución o involución? (co-edited with Jacqueline Cruz, Icaria, 2004), Sexualidad y escritura (1850-2000) (co-edited with Raquel Medina, Anthropos, 2002), among others. She has lectured extensively in the US, Europe, Canada and Latin America. A core faculty member in the Digital Humanities Initiative Program of UMass Amherst, she is directing the project "Gynocine: A History of Women's Cinema." Currently she is working on her new monograph with the tentative title of El género (sexual) del género (cinematográfico).